I have partnered with Life of Dad and Idahoan® Foods for this campaign, but all opinions expressed above are unbiased and true. For instance, the soup is actually as good as I say it is. Seriously. It's exceed all my expectations. 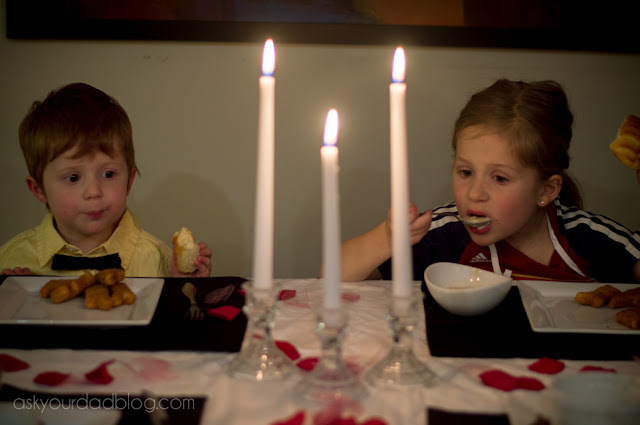 It's January and I am writing about soup again. This time I am working with Idahoan® Foods. 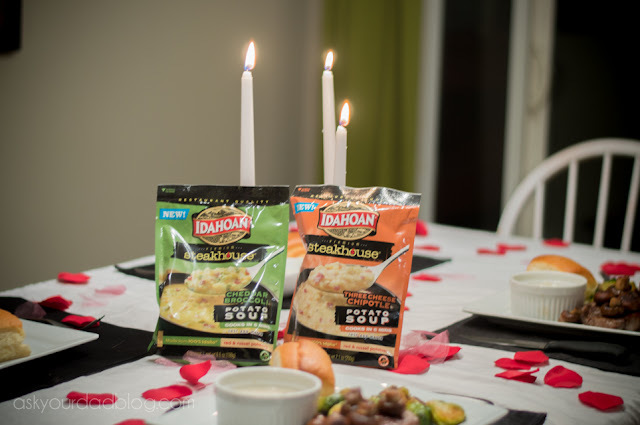 They apparently heard about my love of soup and asked me to give their potato soups a try. 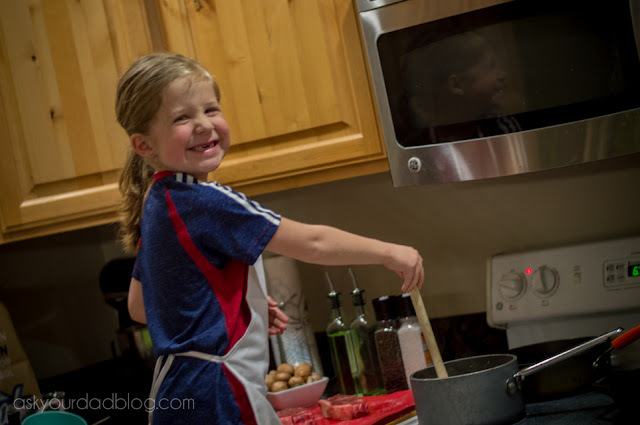 Since this post is also a partnership with my long-time friends, Life of Dad, of course there is a spin on it. 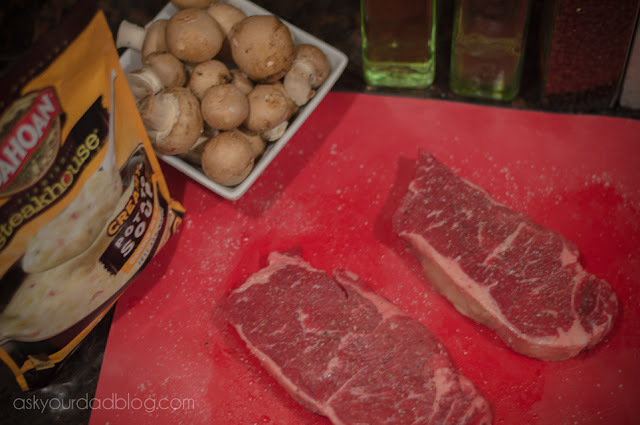 They challenged me to become the "#KingofSoup" by transforming my kitchen into a steak house... and then eating soup. You guys know me. 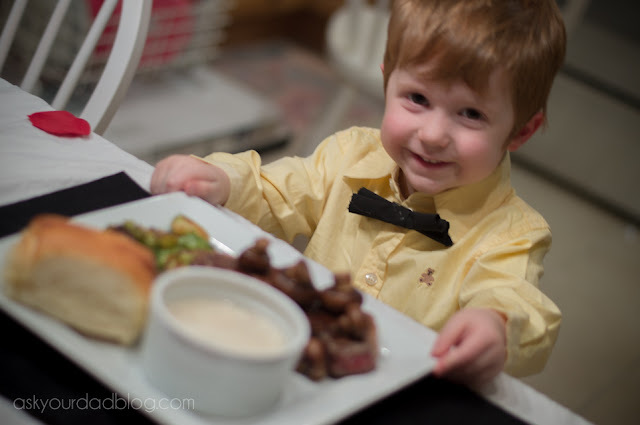 I won't pass up an opportunity to put an adorable bow-tie on my kid and have him serve me steak, so we gladly obliged. I stopped by the store and picked up a couple New York cuts for Stevie and I, and some Dinosaur Chicken Nuggets for the kids. FYI, Dinosaur Chicken Nuggets are the Steak of the kid world. But back to the soup, because that is why we are here. Look guys. I am going to be completely honest. I have long been a lover of powdered mashed potatoes. When I was younger and thinner and more apt to wander off into the mountains for weeks at a time, powdered mash potatoes were an easy and light way to carry calories. 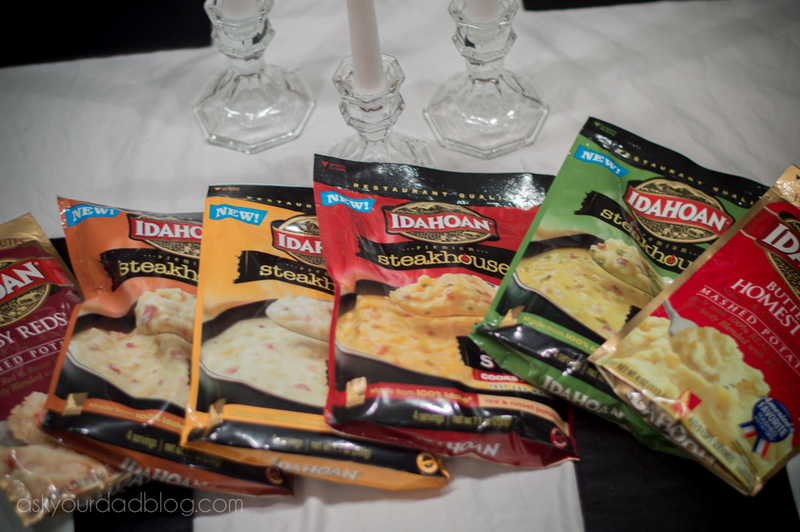 The potatoes I brought were Idahoan® and I loved them very much. Toss a little cheese and some boiling water into a mug with your potato powder and you have a delicious dinner. But could they do soup? The answer is yes. Yes they can. Surprisingly well. It was better than soup I have had at some real steak houses. We made the Creamy Potato one that night. The rest have been eaten since. While I was excited for the soup, Stevie was excited to get to use a tablecloth. That is, she was excited until she realized that our table cloth was in the garage and I may have left the lawnmower on top of it. We're working through that. Instead we used a sheet, because we are classy and our steak house is classy. 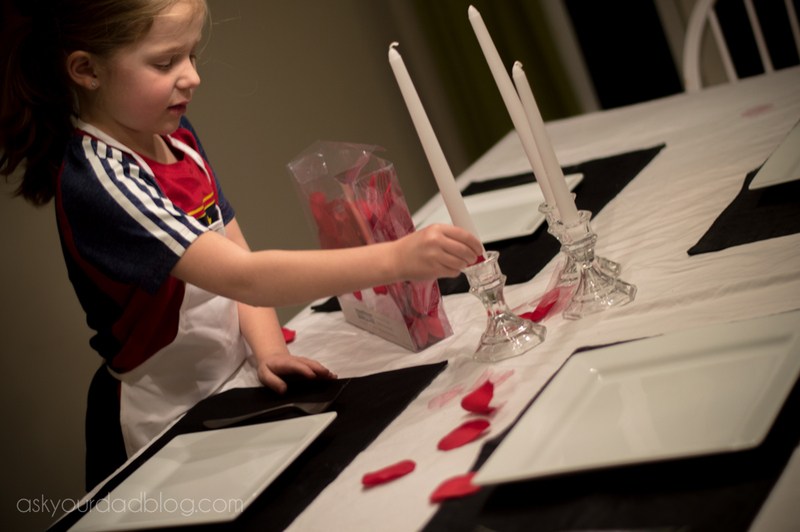 Duchess also decided we needed rose pedals on our table. I tried to tell her that steak houses don't have rose pedals on tables and she just looked at me with eyes that said "You get soup, dad. Let me have rose pedals." I looked back at her and thought with my eyes "How do you do that with your eyes? Did you learn that from your mom?" "Are you trying to fart dad?" "No. I am talking to you about rose pedals with my eyes." "No. I am the #KingofSoup." When a six year old rolls her eyes at you, you know you're parenting at a 10. Duchess didn't just want to set the table. She also wanted to make the soup. 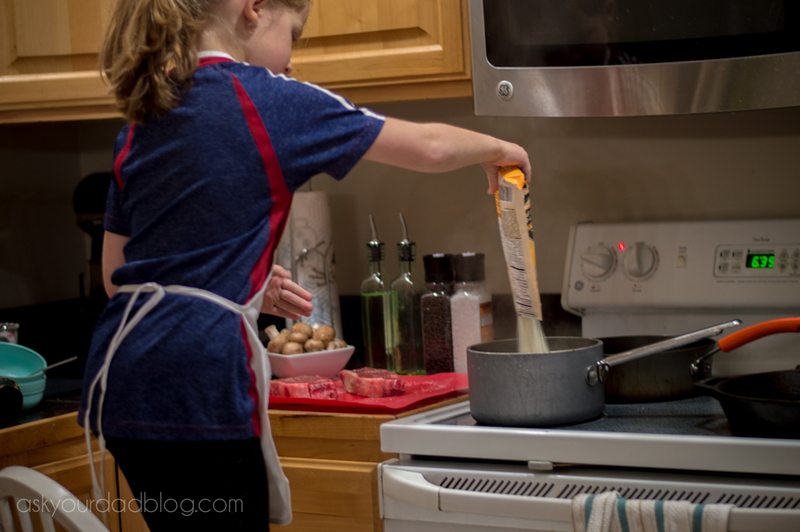 She is getting really good at making all sorts of "pour this thing into that pot" foods. I may be the #KingofSoup, but she is the princess of Mac and Cheese. She did really well with the potato soup too. Captain, on the other hand, cannot be trusted in front of boiling water just yet. 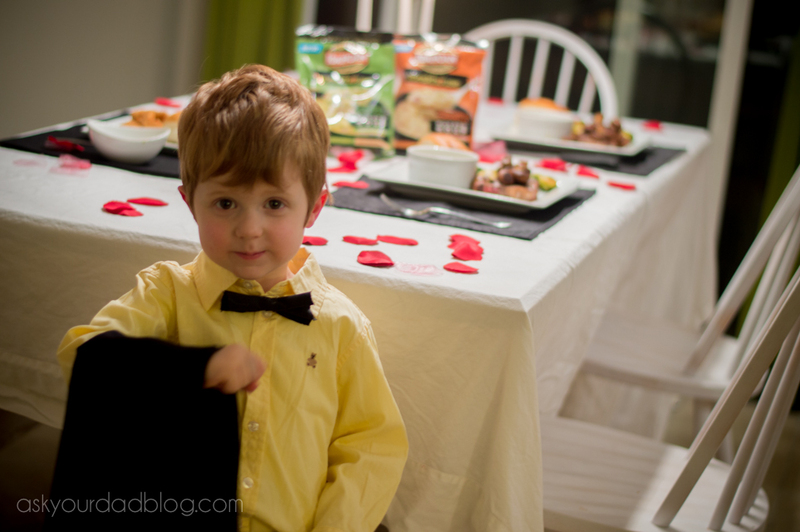 So he got to be the Maître d'. He was just as excited by his tiny bow-tie as I was. I wish I could wear bow-ties. Bow-ties are cool. Unfortunately, at my current weight a bow-tie makes me looked like a tied off upside down balloon... so I live vicariously through my son's bow-tie. That's how parents do it right? Side note. Captain has hit maximum cuteness. We didn't think it was possible for a kid to get cuter, but holy cow. My theory is that since he is the second child and constantly competing for attention that some sort of evolutionary cute gene kicked in and now he has unnatural level's of cuteness. I may be the Soup King, but Captain is so cute that I don't even remember how I was going to finish this sentence. Anyway, that's all I've got. In summation, I still love soup. We got to have a fun date night with potato products, and my kids are pretty swell. Also, Stevie apologizes for not taking any pictures of us. She's not sure how it happened. 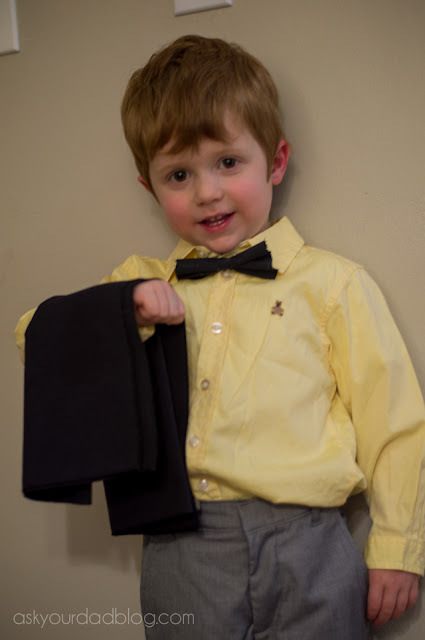 I blame the bow-tie on my unnaturally adorable son. Anyway, try the soup. Seriously, you'll be surprised by how good it is. Try dipping your dinosaur chicken nuggets in it... or your steak.